Dreaming of France is the weekly meme hosted by Paulita at An Accidental Blog where fellow bloggers share their love of anything and everything French. This week I discovered a website that promotes the exchange of culture between America and France. You'll discover books, French writers, new films, art, the works. I think my favorite feature is the calendar which allows you to scroll over a map of the country to find events. I know, I know. You'd rather be there. Me too but if you can't be there in person, watching a French movie is the next best thing in my opinion. One of the events that piqued my interest was the film festival currently running. 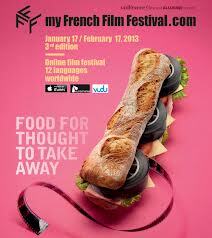 My French Film Festival is an online French film festival slated to run through February 17th. There are various ways to watch the films for a fee online, including iTunes. I hoped you would approve since Dreaming of France is your meme! I just like playing along and peeking at everyone's really cool French stuff -their gorgeous pictures of Paris streets have me salivating. I know this sounds awful but I probably wouldn't bother with a film festival as I'd rather spend time exploring. I would love to visit a really cool old movie theater though. Something with deep red velvet seats and perhaps an art nouveau marquee ala the metro signs. Do you know of one ? I've been to see many French Films at home but I've never been to the movies in France .... maybe one day on my next visit when legs are aching I shall pop into a cinema and see how the French enjoy their movies. Thanks for posting this, I'm off to check it out. Thank you for posting about this-I am going to check it out. I enjoy watching French movies on the tv- we have a multilingual national broadcaster here that plays them regularly- I just don't get a chance most of the time. I think this is a great idea. A couple of the films don't have broadcast rights in Australia, and so aren't available to me. I've only heard of one of them A World Without Women. I am intrigued by Edmond Was A Donkey- the poster looks wonderfully kooky.